There is much to be said for Tesco‘s new approach to out of town shopping. Food only shoppers will find what they want at the front and others will delve deeper finding everything in one location. Despite a lack of signposts in Watford town centre, the car park entrance is relatively easy to access. Slow traffic lights on Lower High Street cause traffic to build up quickly as shoppers enter the store car park, whilst clear signs to the M1 and A41 make exiting the site a much simpler proposition. With 973 spaces, the surface car park has plenty of room to manoeuvre. There are no time limits on parking, allowing shoppers to spend hours perusing the destination store’s extensive range of products. 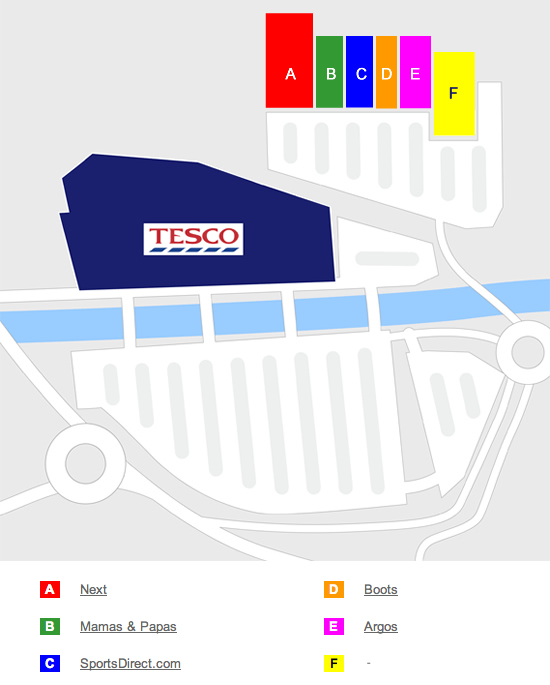 Click & Collect bays are located towards the far end of the car park. Multiple car park staff were welcome given the overflowing wooden trolley parks. A well-landscaped site with many trees at the front and a stream running parallel to the store softens the look of the Tesco building and provides customers with benches for seating and bridges to improve pedestrian access. Giraffe: With its own area at the front of the store, the Giraffe restaurant enjoys a concentration of business at lunchtime, followed by a lull from 3pm onwards. There was a diverse range of clientele, from families to couples to business lunches. As the visit was during the school holidays there were lots of children there. This combination of supermarket and restaurant chain is a new concept and could draw people in due to the novelty factor. On entering, the store has a good personality and ambience. There is one entrance/exit. At first glance the size and ranges could be overwhelming but once you begin to meander round the different sections, the layout and size works well. Food: Per Tesco’s new food first policy, all food is at the front of the store and offers a great choice for customers. Attention is paid to fresh produce, which is attractively displayed in low-level units with spot lighting. The counters (fish, butchers, deli and fresh pizza) are on a central island. The whole fresh produce section has plenty of space for shoppers. The food is kept together, separate from non-food sections – so customers purely wanting a food shop are not impeded or distracted by non-food items – and so keeping to the original aim of a supermarket. Food to go: This section at the front of the store offers the typical food-to-go products along with a fresh salad bar. There were 4 kiosk self-scan checkouts for this area. The Euphorium Bakery with its ‘The Bakery Project’ concept is positioned between food-to-go and Harris & Hoole down the right side. It has a wide variety of fresh cakes and breads and has an independent and upmarket feel to it. Harris & Hoole coffee company have a concession in the middle on the right-hand side of the store. Along with the Giraffe restaurant, this has replaced the need for a Tesco’s own café. Clothing: The clothing is in the back corner of the store, appropriately separated so while walking round it you feel you are in a clothing shop. Seasonal: The seasonal section was offering a wide range of ‘Back to School’ products. Home: Home has a large section at the back of the store. The bays are a mix of wooden and metal and have a department store design. Special offers are displayed at the ends of the bays facing towards the food section. The squares of contrasting wooden flooring allowed clear separate areas to display a large range of home products. The toy department has a large interactive order point linked to Click & Collect, somewhat mimicking the Argos shopping experience. Music,Video,Games: The technology and entertainment department consists of a range of CDs, DVDs and electrical entertainment. Samsung Galaxy Notes and iPads are on display as well as a wide choice of complimentary accessories. Baby: A large baby department with an impressive selection of products displayed on island stands including prams and furniture. The beauty department has a cosmetic store style. Independent make-up counters are dedicated to some specific brands, such as Barry M. Health, while Beauty by Regis offer various treatments, including nail care and waxing. Walking throughout the department you feel like you’re in a Boots or Superdrug. Health and well-being offer a large selection of sports nutrition products embracing the current vogue for exercise related supplements. The extensive range imitated the products of Holland & Barratt. Pharmacy: A pharmacy with an adjoining consultation room is in the far back corner of the store. Speciality: Pharmacy, opticians, technology and entertainment, photo centre, phone shop and click & collect pods run along the back of the store. Good separation of departments using differing display methods and changes in flooring gives a feel of individual shops. It appears Tesco have drawn ideas from high street stores and brought them all into their store, concepts from Holland & Barrett, Argos and Boots can be identified. The toilets are in an unconventional and concealed place with no signage if deeper into the store. They are at the back of the bread/fresh cake section and other customers commented on the difficulty in finding them. There are only 3 ladies cubicles, and a long queue, considering the size of the store and encouragement of the Tesco being a leisure destination. In order to avoid crossing any social boundaries I didn’t venture into the gents toilets, but I imagine if there were 3 toilets in there too it would be sufficient provision for males. A real community focus with a community section in the front by the check outs. Free hessian bags for life were being handed out with the giraffe logo on one side and Watford Tesco on the other with a design created by local school children. This is possibly a launch promotion. There is only one entrance/exit, due to the width of the front of the store and the checkouts running all along it could be useful for an exit only on the left of the store front to ease congestion by the checkouts especially at busy periods e.g. Christmas. Tesco have provided a pleasant and comprehensive shopping experience but it is part of an evolution in supermarket provision and not necessarily the ultimate consumer experience that planners strive for.